The solution is to make "minor adjustments" to three federal entitlement programs that would reduce spending to sustainable levels, says Romney. Washington — America is locked in a pitched battle for global leadership with other major world powers. If the U.S. is to maintain its preeminent position, then it will have to regain its competitive footing by instituting policies that spur innovation, the growth of small businesses and that can lift people out of poverty. Mitt Romney, the Republican Party’s 2012 presidential nominee, offered this prescription for the economy during a wide-ranging talk at a general session of the Association for Advanced Life Underwriting’s 2015 annual meeting. The presentation recounted themes from his failed bid for the nation’s highest office: challenges presented by unchecked growth of non-discretionary spending that is fueling the U.S.’ burgeoning debt; misguided public policies that hinder social and economic mobility; and the need to boost military spending. He also prognosticated on the likely Democratic and Republican party nominees in 2016. 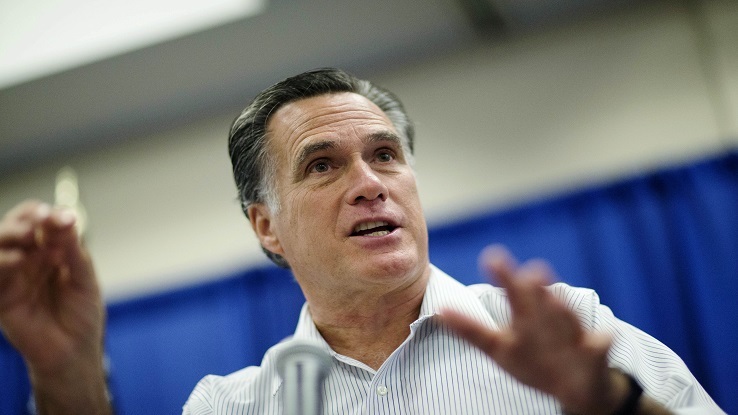 “We’re now facing competition very much akin to that which we faced during the Cold War,” said Romney. “But there’s not a willingness in Washington to deal with the major challenges we have. Topping the list of challenges: the nation’s rising tide of red ink. Romney cited a report of the Congressional Budget Office (CBO), which forecasts that, absent spending cuts or additional tax revenue, debt as a percentage of gross domestic product will rise to 200 percent from the current 70 percent within the next decade. Fueling the rise is the growth in non-discretionary spending on Medicare, Medicaid, Social Security and interest paid on the debt. The last is potentially huge. Recalling a conversation he had with Bill Clinton after his 2012 election loss, Romney said the former president told him that, should interest rates return to normal levels, the U.S. will be spending $750 billion annually servicing the national debt. The solution he added, is to make “minor adjustments” to the three federal entitlement programs — he did not provide specifics — that would reduce spending to sustainable levels. Turning to the U.S.’s persistently high poverty rate – about 15 percent, a level little changed since the 1960s — Romney noted that indigence is significantly lower (just 3 percent) among Americans who (1) graduated high school, (2) held a job; and (3) got married before having a first child. Unfortunately, he said, current public policy provides “enormous disincentives” to fulfilling these goals. Schools, particularly in the inner cities, are often unsafe and don’t provide the incentives and discipline needed to encourage kids to keep to their studies. Employers, too, shy from hiring people without work experience, in part because of a lack of government-funded financial incentives to do so. Those individuals who do manage to obtain work stand to lose government benefits that could outweigh the additional earnings from wages. As to the poor having children out of wedlock, Romney placed much of the blame on federal policy. Poor individuals who get a job may suddenly no longer qualify for Medicaid, housing vouchers or Temporary Assistance for Needy Families (TANF). The same outcome, he added, often awaits a poor woman who marries. The new spouse’s income is counted jointly with hers, disqualifying her for federal assistance. Romney also bemoaned cutbacks in military spending –this at a time when U.S. faces greater external threats than at any time since the end of the Cold War. Among countries the U.S. needs to be on guard against: a resurgent Russia now embedded in Crimea and eastern Ukraine; Iran, which many fear aspires to become a nuclear power; terrorist acts being carried out by the Islamic State and al Qaeda in the Middle East; and most importantly China, which lays claim to much of the South China Sea and is investing significantly in its growing Navy. During a follow-up question-and-answer discussion with outgoing AALU President Anthony Domino, Romney attributed Americans’ ill-preparedness for retirement and underinvestment in life insurance products in part to continuing uncertainty about the nation’s uncertain economic outlook and policies that don’t encourage long-term savings. Pivoting to the 2016 Presidential campaign, Romney said the lack of caps on campaign spending has prompted candidates to devote ever more of their time to fundraising–to the detriment of quality time they should be spending with voters. The Republican nominee, he added, will likely be a centrist who can appeal to both the fiscal and social conservative wings of the GOP. 3) that she shares President’ Obama’s unrealistically dovish foreign policy.